Spiders are creepy! I mean, they are kind of neat, but mostly they cause people to scurry away in fear and sometimes even emit high-pitched shrieks. Well, if you are one of the people who can't stand those little multi-legged crawlers, you might be in luck. A new study has found that it is possible to turn people from arachnophobes to spider-tolerators in just one therapy session. 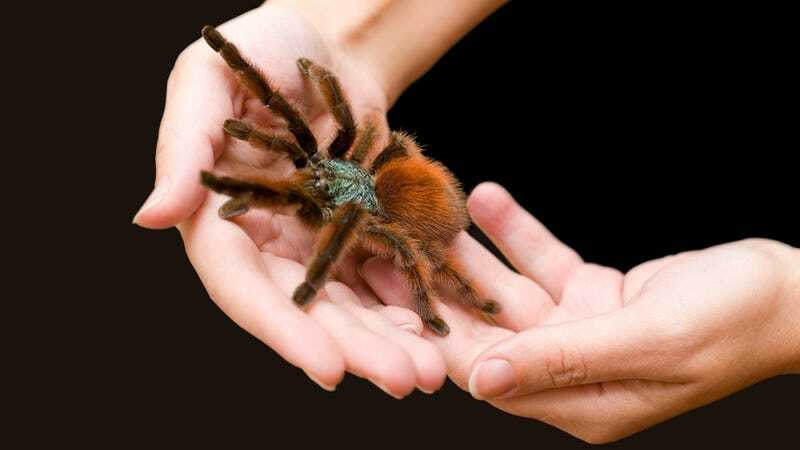 Researchers at Northwestern University studied 12 people with a severe fear of spiders, and they found that just two or three hours of therapy was enough to change their brains sufficiently so that they were comfortable holding a tarantula in their hands. Ahh! Why would you ever want to do that? It's pretty amazing, actually, considering that most of these people couldn't even look at pictures of spiders before treatment, and the closest they'd come to a tarantula was about 10 feet away. So what went on in these magical therapy sessions? Apparently the patients learned the "truth" about tarantulas, which is that they're just trying to hide from us, and, contrary to our worst nightmares, they cannot leap out of their cages. They then also worked to move the patients closer to the tarantula and got them used to touching it with an item like a paintbrush or a glove. (The poor tarantula must have been like, "What is this weirdo doing to me?") Then, after all was said and done, the patients were fine with letting the spider onto their hands. The changes that occurred in their brain lasted for about six months, so it's not a permanent cure. But it's a start! It's just too bad this can never be used to cure a fear of snakes, because everyone knows the "truth" about them is that they are soulless killers who really should not be able to move around without lets and yet somehow can—in other words, pure evil.